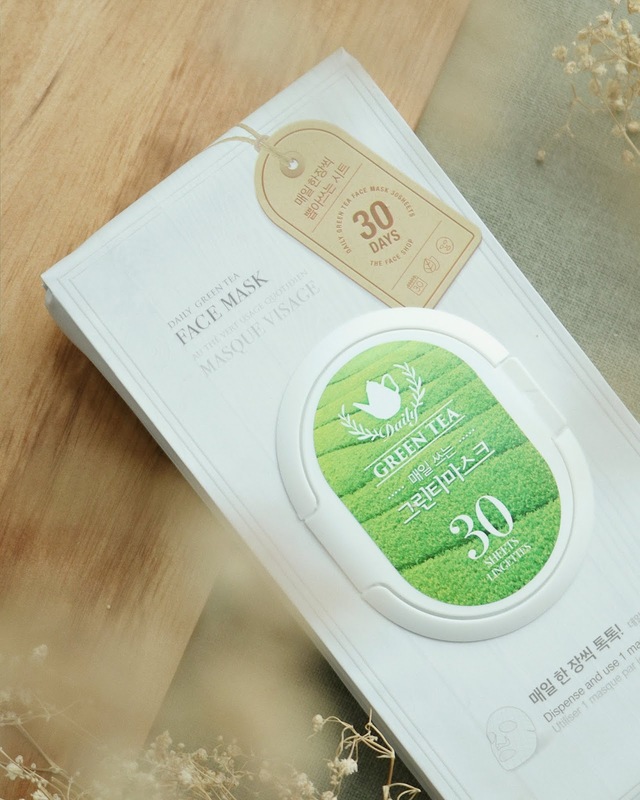 Hi guys, today I'll be sharing my review of THE FACE SHOP's Daily Green Tea Face Mask. 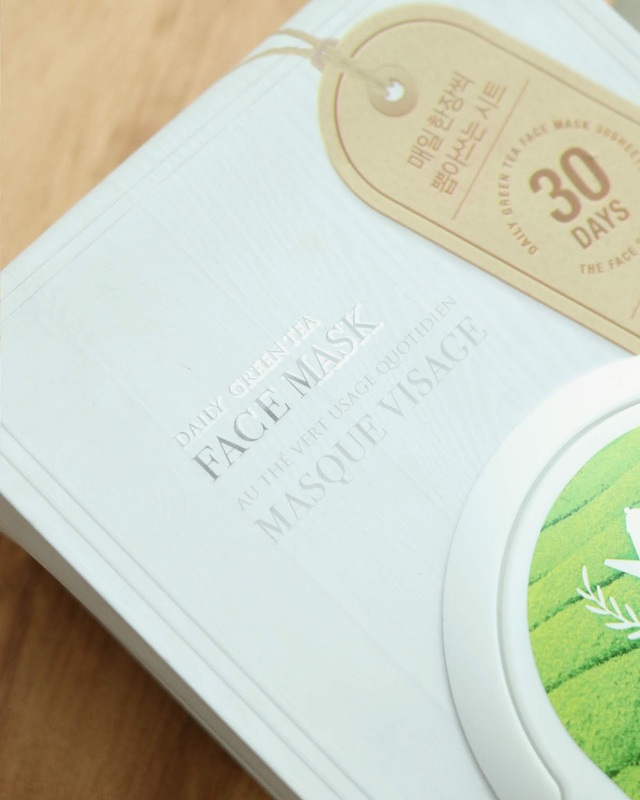 These sheet masks contain green tea water extracts that replenish the skin, leaving it hydrated and feeling fresh. 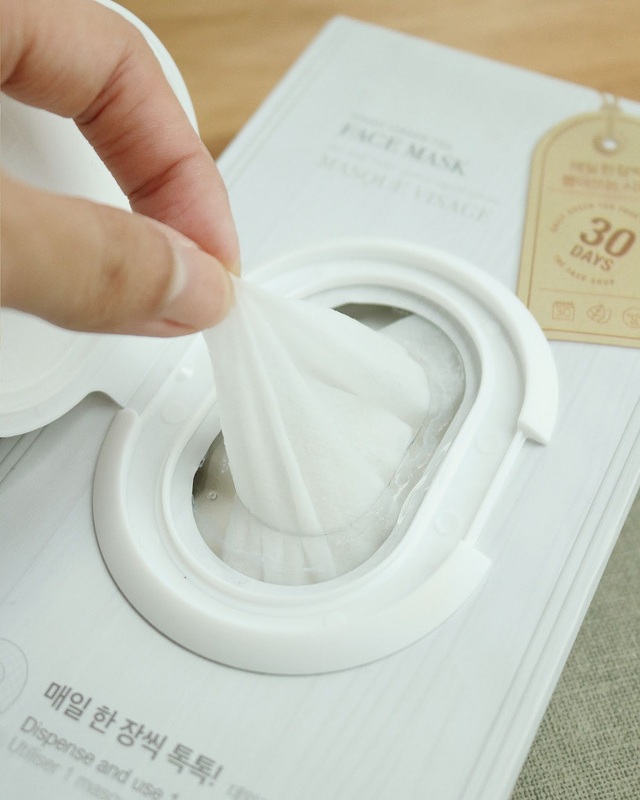 What's great about it is that it comes packaged for daily use like a wet tissue packet, reducing the amount of plastic you would normally have to discard if you buy sheet masks individually. These masks also claim to tone, hydrate, brighten and contain anti-oxidants to help keep the skin bright, fresh and young. I got mine in-store in Pavilion, but you can currently get it on THE FACE SHOP's E-store as well for RM88. 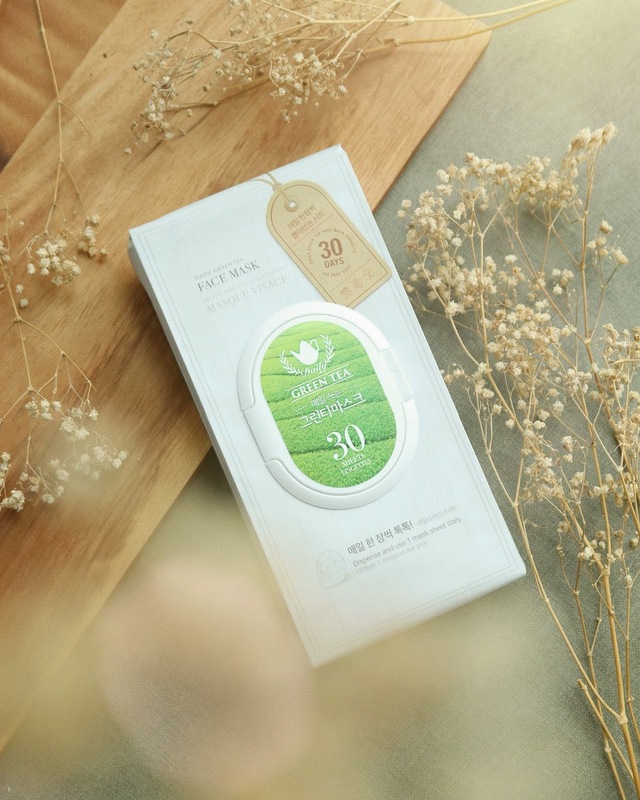 It contains 30 sheets, so each sheet mask amounts to about RM2.90. Once you open it, you'll see the opening where you can get the masks. When I first got this product, it was sealed, and I had to pull the silver seal out. 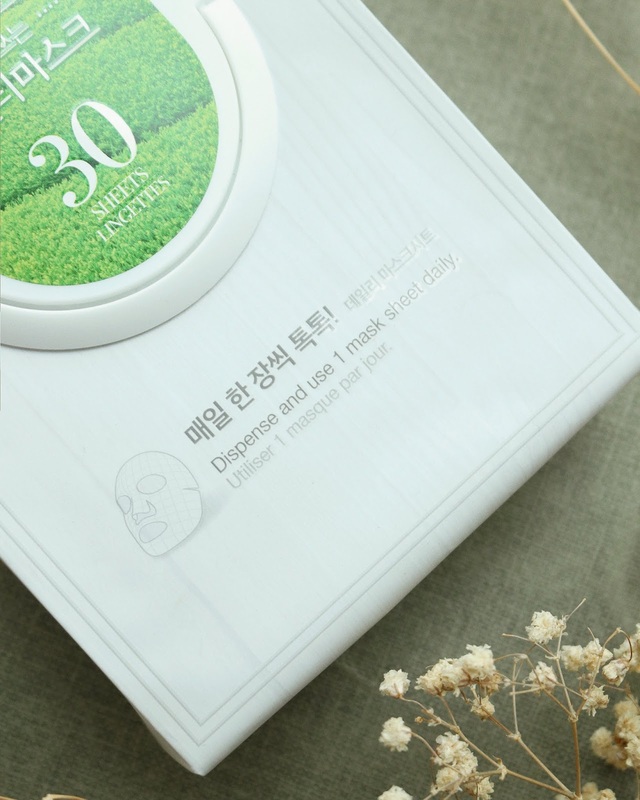 This product contains 350g worth of product, so if you divide that by 30 it's 11.67g per mask. 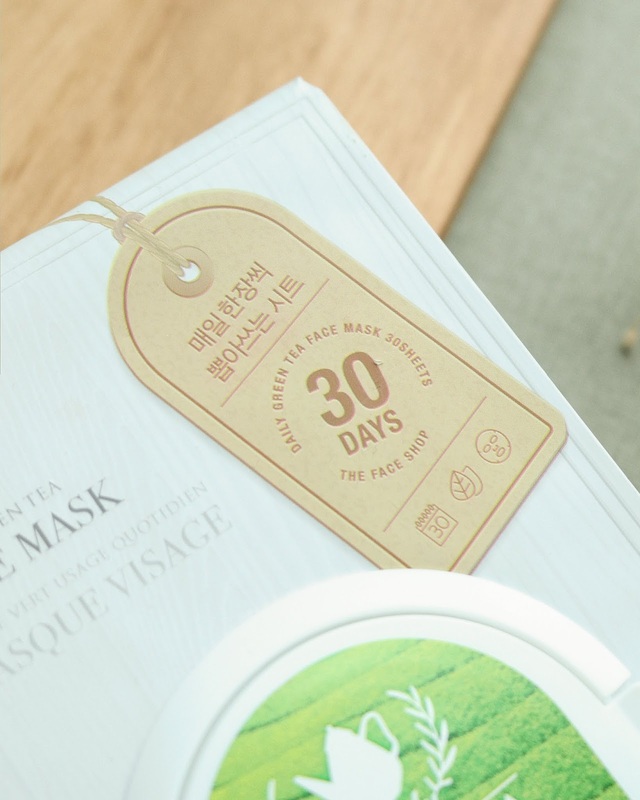 Just for comparison, a normal sheet mask usually contains around 20g of product. 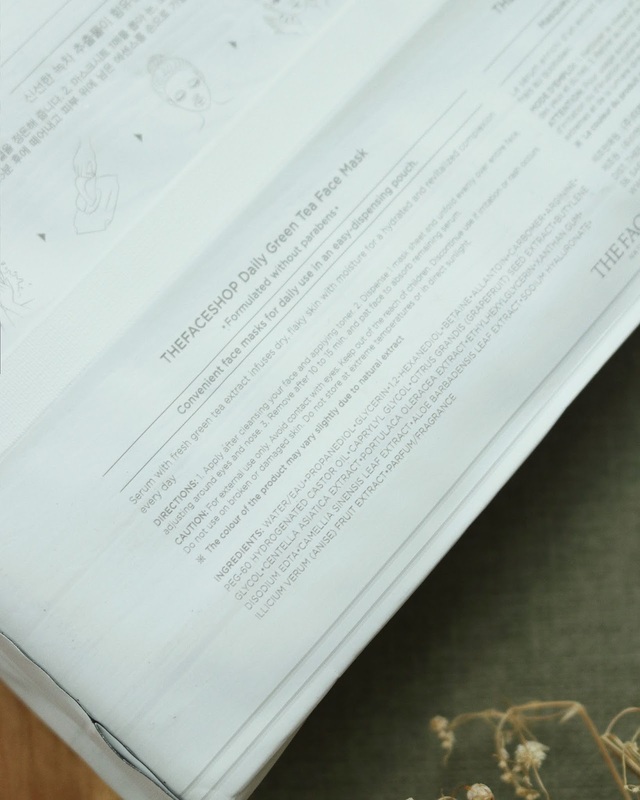 This product features a clean ingredients list and contains mostly EWG green-level ingredients, meaning they're very unlikely to irritate the skin. It's paraben-free, sulfate-free, alcohol-free, silicone-free, EU allergen-free & fungal acne safe. When I first opened the cover, I immediately smelled the green tea scent. I wouldn't say that it's strong or overbearing, but I will say that the scent is there. It does not fade, but I don't really mind it. 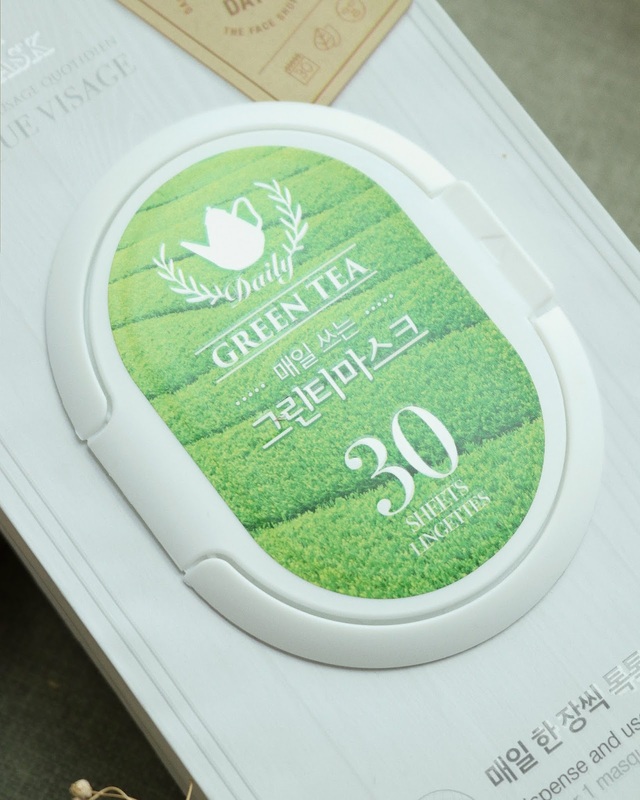 If I had to describe it, I'd say that the scent's light, fresh and "cooling", and that it reminds me of Innisfree's Green Tea Seed Serum. 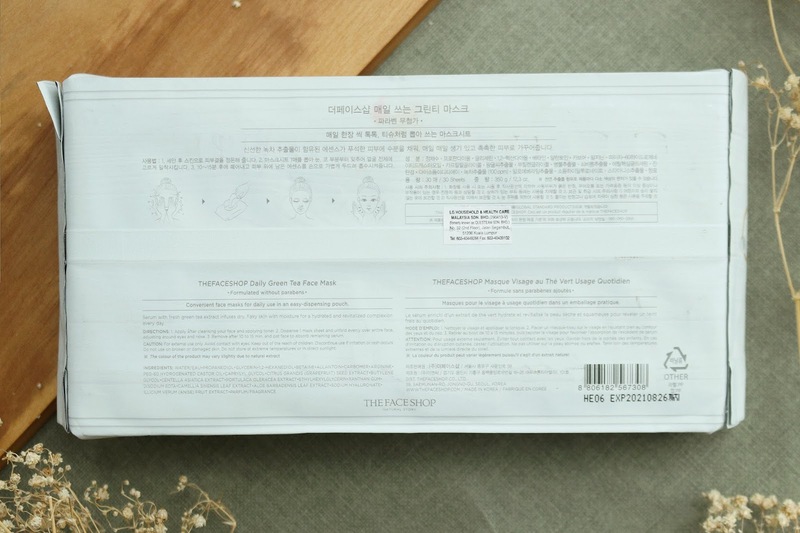 The sheet mask itself is like any normal cotton sheet mask. I do feel like you have to cut it a bit if you have a large face like me. Since the essence is quite thin, I feel like it's okay to apply serums after it. 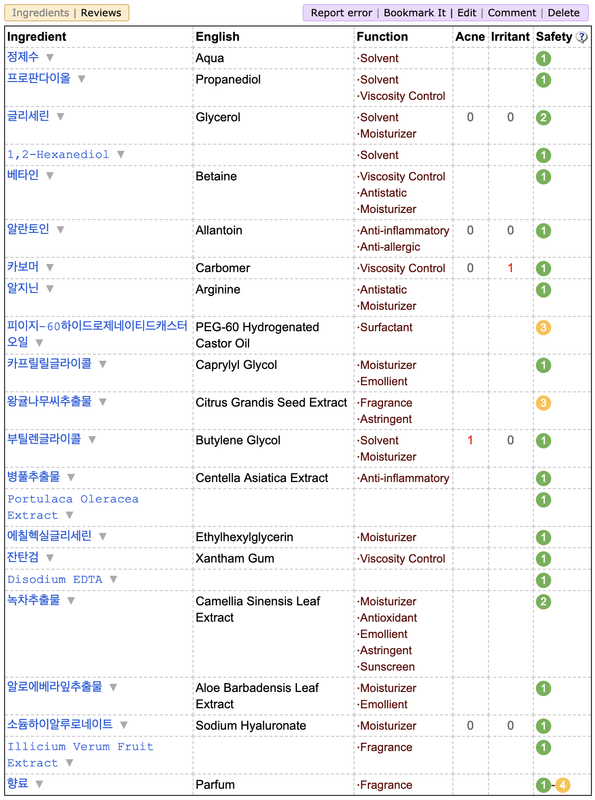 I usually use this sheet mask in the office, so I finish it up with moisturizer + sunblock. I think this product is pretty basic, but in a good way. 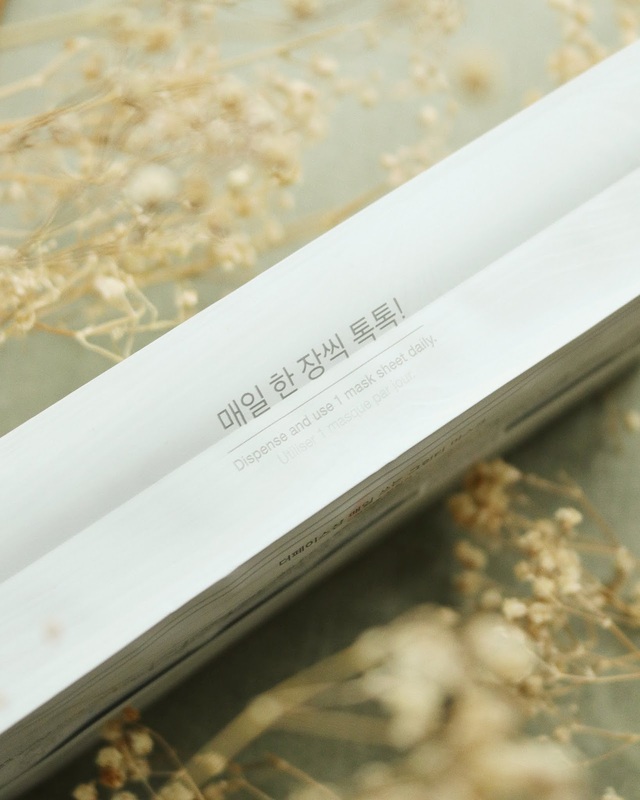 It's a good product to maintain my skin's hydration level + to soothe my skin in the morning. I like how I've come to associate the green tea scent with my mornings now too haha. Overall I like this product. It does what it says it'll do and it stays pretty fresh/intact even without me putting it in the fridge. I think this is also great for someone who's environmentally aware and would like to lessen their plastic waste! Definitely! I try to use it daily but I only ever use it in the office (so it will last me a little over a month). Since the cover is pretty tight, you can keep it for longer as well. Its affordable so I wouldn't mind repurchasing! And that's it for this review! 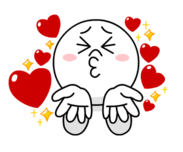 Thanks for dropping by, see y'all in my next post!